Centaurs were reoccurring creatures in the tales of Greek mythology, and of course the half-man, half-horse creatures are amongst the most recognisable creatures of mythological Ancient Greece. The story of the centaurs, and their mythological origin, begins upon Mount Olympus, the home of the gods, in a time when select mortals were welcomed to the banquets hosted there. One invited guest was Ixion, the former king of the Lapiths, who had treacherously killed his father-in-law. Zeus himself had cleansed Ixion of his crimes, and had welcomed him to Mount Olympus. Ixion though did not behave as a guest should, and the mortal started to lust after the beautiful goddess Hera, the wife of Zeus. 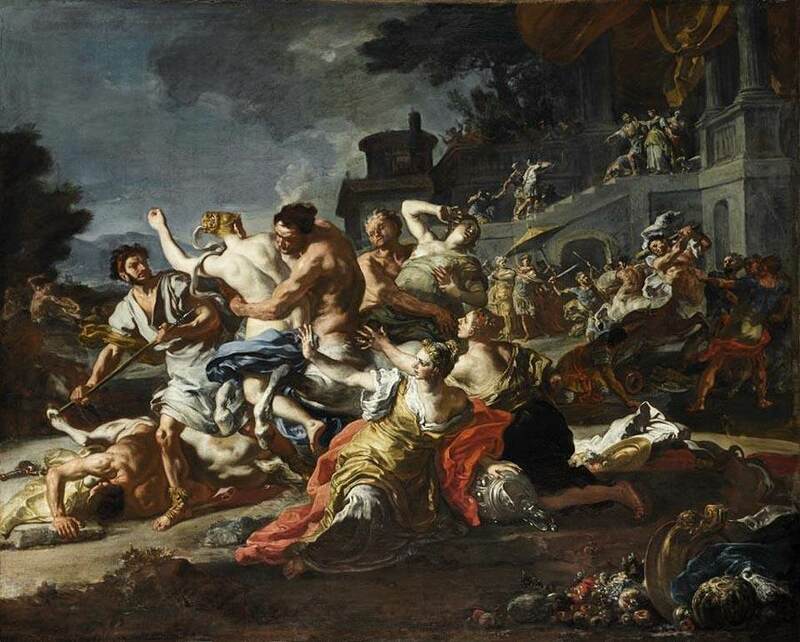 Zeus was informed of Ixion’s intentions, where Hera was concerned, but Zeus would not believe a guest of his would act in such a manner, and so decided to put Ixion to the test. Zeus crafted a doppelganger of Hera from a cloud, with this double being named Nephele. The presumptuous Ixion ended up sleeping with Nephele, and the indiscretion of Ixion also saw him boast of having slept with a goddess; Ixion believing that Nephele was Hera. Presented with proof of Ixion’s actions, Zeus would set out eternal punishment for Ixion in Tartarus. Having slept with Ixion, Nephele of course became pregnant. In Greek mythology, there is some disagreement about just whom Nephele was pregnant with; some saying she was pregnant with all the centaurs, whilst others claim that she bore but one son, Centaurus. In the case of just one son, Centaurus being born, this son of Ixion and Nephele was said to have been born deformed and so was shunned by both man and god alike. Centaurus would make his home in Magnesia, and there, would mate with the Magnesian mares, bringing forth the race of Centaurs. The original home of the centaurs was said to be upon Mount Pelion, a mountain located in eastern Magnesia within Thessaly. The majority of the centaurs were described as savage residing in caves, and using clubs to hunt for their food. It was also originally said that all centaurs were males, which is why they were so prone to abducting women, but the idea of the female centaur, a centauride or centauress, did emerge in later mythology, especially in Roman mythology. The centaurs come to prominence in Greek mythology because of the part they play in the Centauromachy, the War of the Centaurs. Pirithous was the King of the Lapiths and upon his wedding to Hippodamia, the king took it upon himself to invite the centaurs to the wedding banquet; the centaurs were after all considered kinsfolk of the Lapiths, being descended from Ixion the former king of the Lapiths. At the wedding banquet the centaurs would become drunk, as was the nature of the centaur, and savagery took them. En Masse, the centaurs decided to abduct the females at the wedding banquet, Hippodamia included. The centaurs though were not the only guests at the wedding, for Pirithous had also invited the likes of Theseus, Peleus and Nestor, all heroes of note in Greek mythology. Thus, as the centaurs attacked, so the heroes, Pirithous included, took up their weapons. 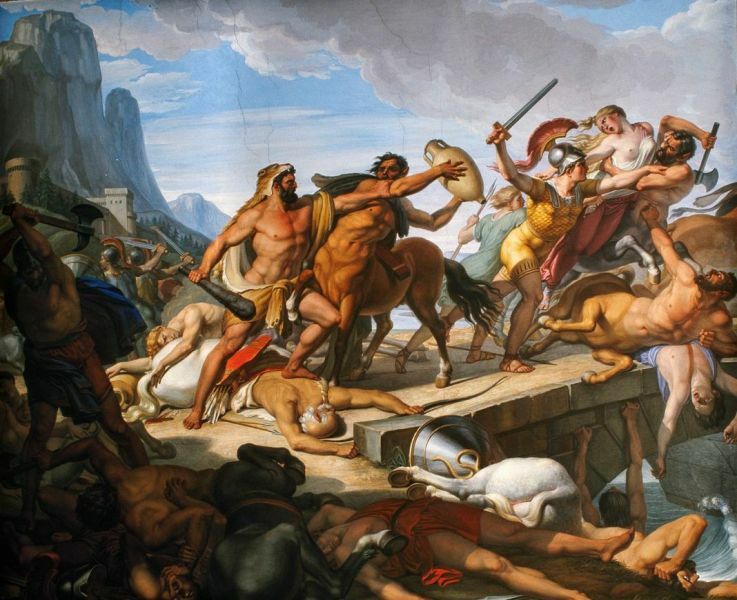 The savage strength of the centaurs was of course no match for the skill and weapons of the Greek heroes, and in the ensuing battle many of the centaurs were killed. These pockets of survivors were the ones who would individually become famous in Greek mythology. The Greek hero Heracles would encounter the centaurs of Mount Pholoe when he was seeking out the Erymanthian Boar for his Fourth Labour. Upon Mount Pholoe, Heracles would receive a hospitable welcome in the cave of Pholus, one of the civilised centaurs. Pholus was a famous augur, and indeed, Mount Pholoe was named after the centaur; and writers in antiquity explained the civilised nature of Pholus through his descent, not of Ixion, but of the satyr Silenus. Pholus would cook Heracles a sumptuous meal, but then Heracles insisted that a jar of wine be opened to wash down the meal. Pholus was wary of doing so, but Heracles insisted. ​The aroma of the wine attracted the other centaurs of Mount Pholoe, and a mass of centaurs gathered outside Pholus’ cave, each demanding a share of the wine. 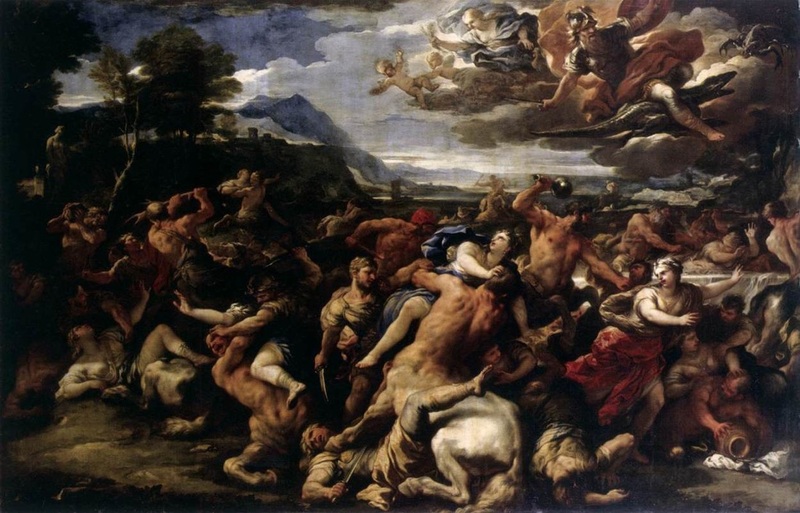 Heracles would wrestle with the centaurs who tried to enter Pholus’ cave, but when it became possible he might be overcome by sheer numbers, Heracles took up his bow. Heracles’ arrows quickly killed off many of the centaurs, and the rest soon fled, with Heracles in pursuit. Pholus, being a civilised centaur, would seek to bury the centaurs killed by Heracles, but as he did so, Pholus was scratched by one of the deadly arrowheads, and so the poison of the Lernaean Hydra, for that was what the arrows had been dipped in, would killed Pholus, just as it killed so many other centaurs. Pholus would himself received a magnificent funeral, for Heracles found the body of the centaur who had been so welcoming to him, and honoured him in the manner he felt best, burying him at the foot of Mount Pholoe. Chiron was another of the civilised centaurs, born to Cronus and Philyra, rather than being a descendant of Ixion. Considered to be the wisest and most skilful of all centaurs, Chiron was also said to be immortal. The knowledge of Chiron was passed on to many famous students, including the likes of Asclepius, Jason and Achilles. Despite being immortal, Chiron would die, for he was caught up in the pursuit of Heracles and the centaurs of Mount Pholoe. One of Heracles’ arrows passed through a fleeing centaur and hit Chiron, but because he was immortal, the poisonous blood of the Lernaean Hydra did not kill him, but instead caused him immense pain. Chiron had immense knowledge of medicine, as had been showed by his training of Asclepius, but the skill of Chiron was not sufficient to cure himself. ​Thus, Chiron would give up his own immortality in order to rid himself of the pain. Zeus would acknowledge the greatness of the centaur Chiron, by placing the centaur amongst the stars, as the constellation Sagittarius. 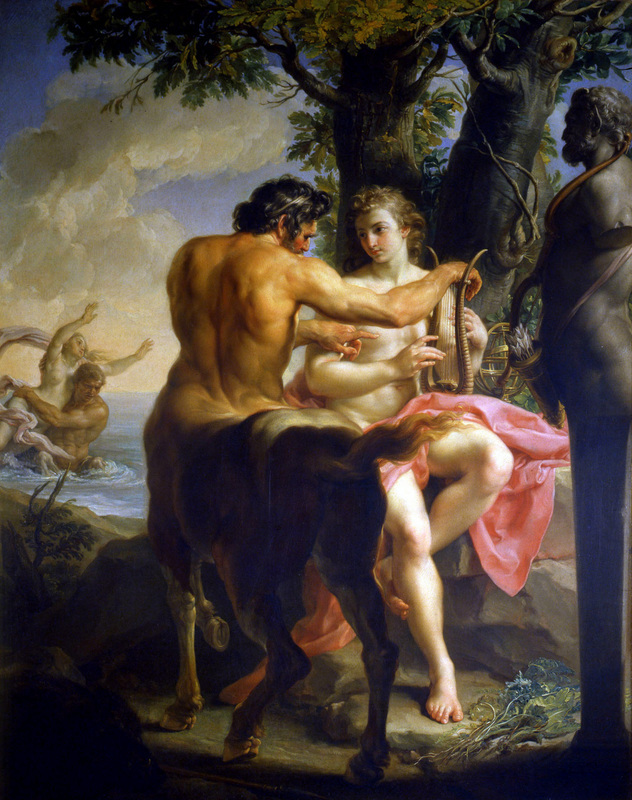 A third famous centaur was Nessus, although he was not civilised like Pholus and Chiron. Indeed, Nessus had been present at the wedding of Pirithous and Hippodamia, and was amongst the centaurs who had tried to carry off the bride; when the battle had broken out Nessus had managed to flee unharmed. 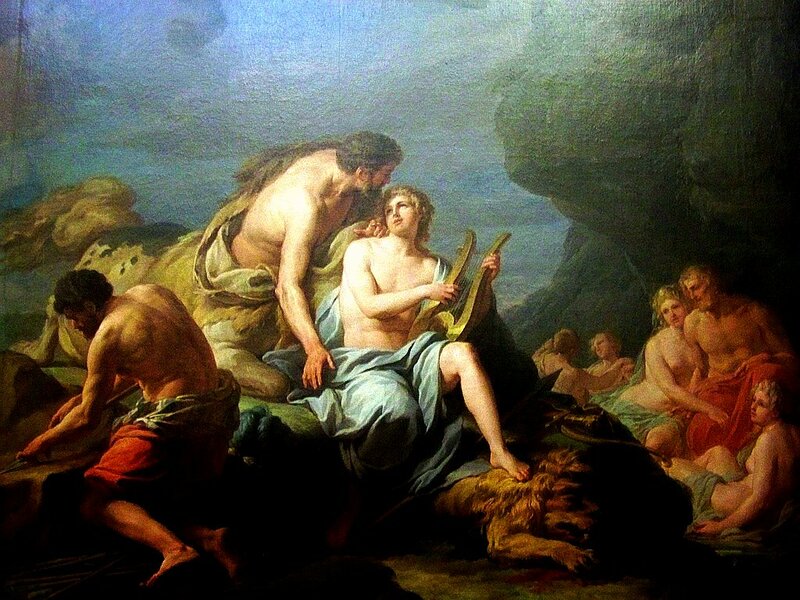 Having left Thessaly, Nessus had made a new home from himself in Aetolia, and made himself useful by acting as the ferryman across the River Evenus, with those wishing to cross the river riding upon the back of the centaur. 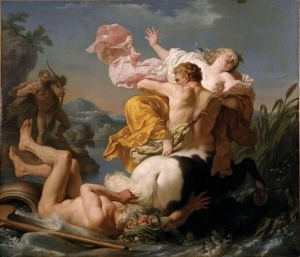 Heracles and Deianira would find themselves in need of a ferryman across the river, but when Deianira was on the back of Nessus, the centaur decided to abduct her. The width of the river though was not far enough to stop Heracles unleashing his arrows though, and one struck home, killing Nessus. The death of Nessus would eventually lead to the death of Heracles though, for later Deianira would give Heracles a cloak dipped in the blood of Nessus. When Heracles put the cloak on the poison of the blood of the Hydra, in which his arrows had been dipped, leached into the hero’s body, ultimately killing the Greek hero.